On 21 November, 1,500 soldiers from 2 Canadian Mechanized Brigade Group (2 CMBG), headquartered in Petawawa Ontario, completed Exercise STORMING BEAR. Led by the 4th Canadian Division, Exercise STORMING BEAR was the first major exercise on 2 CMBG’s Road to High Readiness army training cycle. The Road to High Readiness is the Canadian Army’s flagship training regime that prepares soldiers for domestic or expeditionary deployments. Exercise STORMING BEAR commenced on October 24, 2016. The live-fire, combined arms training events featured complex groupings of soldiers alongside armoured vehicles, supported by artillery fire, CH-147 Chinook and CH-146 Griffon helicopters, and other supporting personnel. 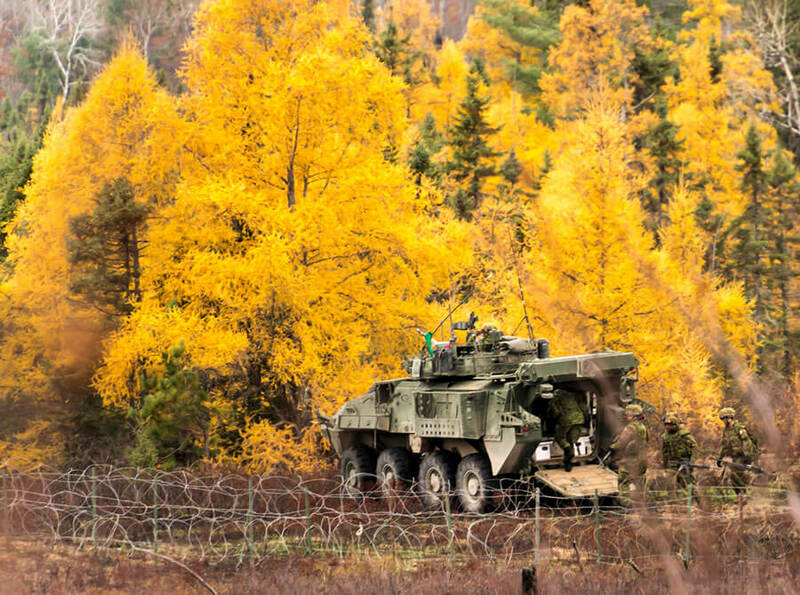 Members of 2nd Battalion, The Royal Canadian Regiment, as well as C Squadron, Royal Canadian Dragoons conducted their portions of Exercise STORMING BEAR in Gagetown, New Brunswick. Held concurrently in Petawawa, Ontario and Gagetown, New Brunswick, Exercise STORMING BEAR included a series of dynamic live-fire training events over diverse terrain. "Exercise STORMING BEAR was an essential stepping stone for the soldiers from 2 Canadian Mechanized Brigade Group on their Road to High Readiness,” stated Colonel Conrad Mialkowski, Commander, 2 Canadian Mechanized Brigade Group. “Ensuring that these soldiers can move, communicate, and fight in a complex, combined arms environment proves their versatility and shows that they are ready, when the time comes, to deploy domestically or abroad." Participating units in the exercise included: 1st, 2nd, and 3rd Battalions; The Royal Canadian Regiment; The Royal Canadian Dragoons; 2 Royal Canadian Horse Artillery; 2 Combat Engineer Regiment; 2 Signals Squadron; 2 Service Battalion; 2 Field Ambulance; and 450 Tactical Helicopter Squadron, 408 Tactical Helicopter Squadron, as well as supporting personnel. Soldiers of 2 Canadian Mechanized Brigade Group commenced training on The Road to High Readiness in July 2016. 2 CMBG will become the Canadian Army’s High Readiness Task Force in the summer of 2017, taking over from 1 Canadian Mechanized Brigade Group.